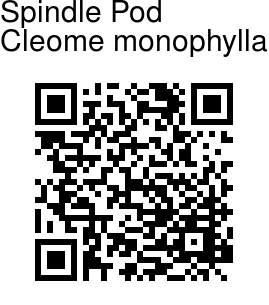 Spindle Pod is an erect annual herbs, up to 40 cm high, glandular-velvet-hairy; stem branched, angled, striped. Leaves are simple, 1.5-5 x 1-2.5 cm, ovate-oblong, or linear-lanceshaped, base flat, margins fringed with hairs, tip pointed; leaf-stalk up to 3.5 cm long. Racemes at branch-ends, lax, up to 15 cm long. Flowers 1-1.5 cm across; flower-stalk up to 8 mm long, glandular velvet-hairy. Sepals 3-4 mm long, linear, tapering. 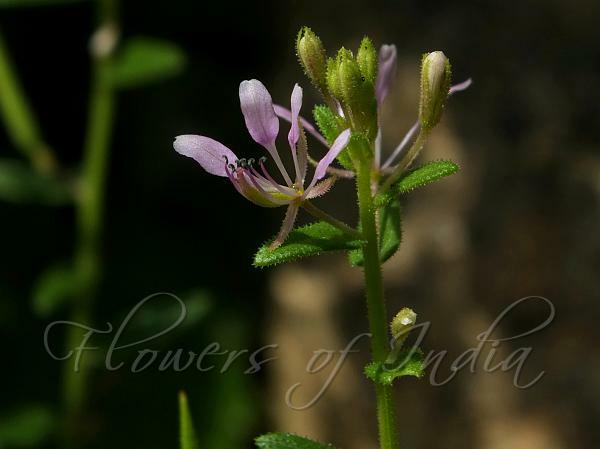 Petals are pink or light purple, 6-10 x 1.5-2 mm, obovate or spoon-shaped, base clawed, tip rounded. Stamens 6; filaments 5-8 mm long, unequal. Ovary 5-8 mm long, linear. Capsules are 7-10 cm long, linear, nearly cylindric, beaked, strongly ribbed, glandular, hairy. Seeds are about 2 mm across, subobicular, ridged, dark brown. Spindle Pod is found in Tropical Asia.